When can a private car travel in a lane marked by this sign? When can a private car travel in a lane marked by this sign? If traffic is queued, prolonging the distance you have to stay in your lane rather than let you into the bus lane disadvantages traffic flow for no good reason, i.e. when you've moved into the bus lane your place will be taken by the vehicle behind you, thus improving traffic flow. However, much more than 100m and vehicles would start to abuse it. In other countries, such as New Zealand, the distance is 50m. Judging 100m is a tricky thing. Local roading authorities may be videoing the bus lanes to prosecute drivers that cheat the system, and you don't want to get caught out if you are genuinely turning. 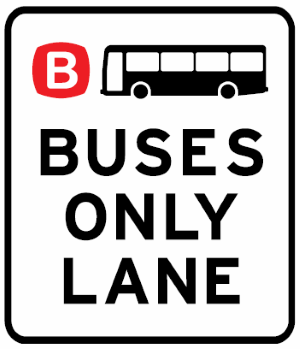 Bus lanes can be used by taxis, hire cars, vehicles operated by (or under the direction of) Roads and Maritime, bicycles and motorbikes, unless the lane says "Buses Only Lane". So, if you see what you think is a normal passenger car using the bus lane, don't assume that you can use it, too - it could be a hire car. Taxis and hire cars can stop in bus lanes to pick up or set down passengers. 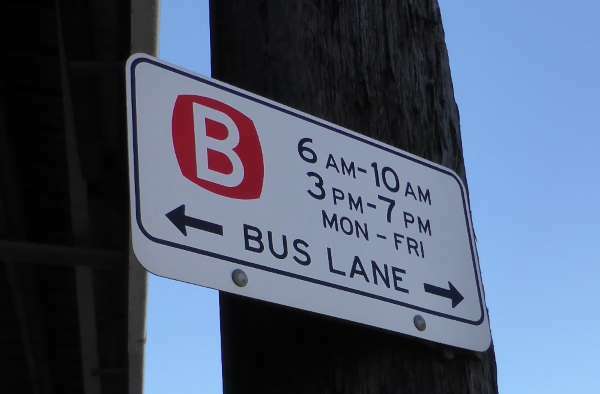 Bus lanes might have time limits on them, like the sign says below. If they don't, they're in operation 24 hours a day. You can expect to see more and more bus lanes as time goes on. Bus lanes are almost never removed once in place because local authorities prefer to have people use public transport to reduce pollution and congestion. As you can see from goals 7 and 8 in this presentation, Roads and Maritime intend to reduce congestion and increase public transport patronage.